It’s a tough business opening a bar in Appleton, the place that was infamously found to be the drunkest city in America in 2016. 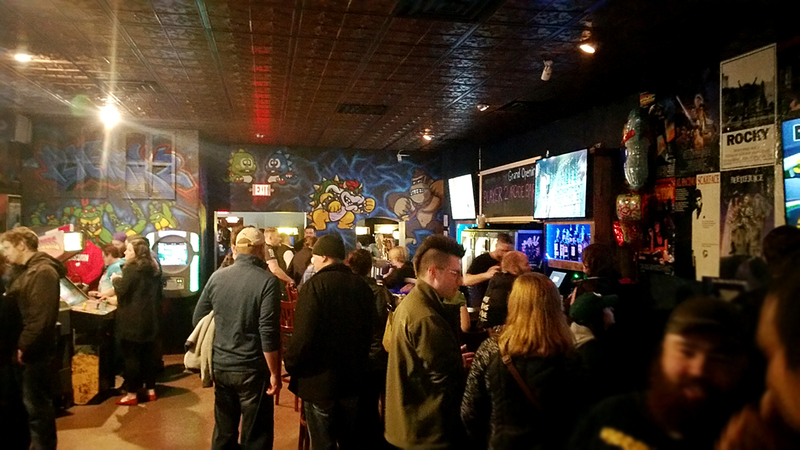 P2 has found an obvious niche to fill by functioning as an arcade, something Appleton has been lacking since the last real arcade in the city — Pocket Change in the Fox River Mall — shuttered in the early 2000’s. 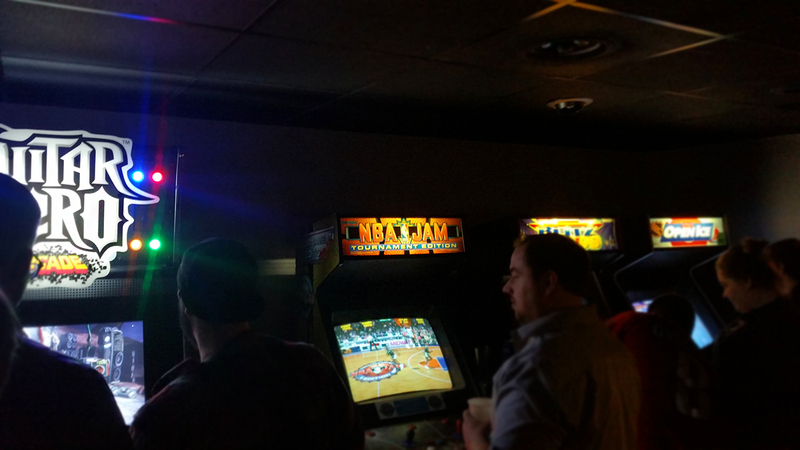 So this new place has to pull double-duty as both a bar that’s competitive with the approximately 72 billion other bars in the city, and as an arcade that’s good enough to pull in gamers and nostalgic adults alike. So how is it? Let’s start with the layout. The space is separated into a large front bar room, with a small, low-ceilinged room behind it, then a corridor where the bathrooms are located, and finally a medium-sized back room with another, smaller bar. I had been in this building once years ago in its previous life as — guess what, Appleton — a different bar to see a band in this back area, and from what I can recall the floorplan was the same. They officially opened their doors at 6 pm, and I arrived a little after 9. The place was nice and busy, but not packed shoulder-to-shoulder. I took a quick walk around to see how the games were laid out, and headed back up to the front. Of course I was there to play games, but everybody knows that if you’re gonna be in a bar, you have to support them by having at least one drink or else you’re a real jerk. The bar was staffed with at least 3 bartenders who were attentive and friendly, and I was able to walk right up without a wait. The full bar has a good selection of canned and draft beers, with some good craft beers on tap, which was a good sign that they’re taking the bar side seriously and not just serving Bud Light in an arcade. Tokens — yes, the games run on tokens, not quarters or prepaid cards — are available at the bar, so I got a beer and $10 worth of coins. It was pretty cool to be handed a cup full of shiny, brand-new, custom-made Player 2 tokens, and I’m sure I’ll toss a couple of them in my collection of arcade tokens that I’ve acquired over the years. I tipped the bartender a couple bucks, took a pull off my beer, and began wandering around. The games are arranged thoughtfully. Two brand-new Stern pinball machines — Ghostbusters and Guardians of the Galaxy — are all the way in the front, by the large street-facing window. Most of the games in the front bar are well-loved multiplayer titles, like Teenage Mutant Ninja Turtles, The Simpsons, Captain America and the Avengers, and Sunset Riders. There’s also an After Burner upright (presumably included in the front just because the cabinet is super rad), and next to the bar is a table with a Nintendo 64 running Mario Kart on a flatscreen. It’s clear that the front bar is encouraging friends to get together to play and drink, which is great thinking on their part. Graffiti-style spray-paint artwork adorns the walls, featuring Bowser, Ninja Turtles, Bub and Bob, Donkey Kong, and others. Moving into the middle area, there are sports games (NBA Jam, NFL Blitz, Open Ice) and some of the larger, custom-control games like Guitar Hero, Area 51, and Off Road. Also in this small area, we find the one lone shmup in the entire place — the original Raiden, in nice condition. Then we get to the back bar, and I’ll just come right out and say it: this is where the good stuff is. The real classics: Donkey Kong, DK Junior, Mario Bros., Joust, Centipede (actually a trackball multigame also containing Millipede, Missile Command, and Let’s Go Bowling), Space Invaders Deluxe (again, a Taito multi), Ms. Pac-Man, BurgerTime, Galaga, and more. The fighting games are back here too, like Street Fighter II Turbo, Virtua Fighter, and Marvel vs Capcom 2. This is the area where the real nerds are gonna be, so naturally it was my favorite part of the bar and where I spent the most time. The games are all in good shape for the most part. There were definitely a few monitors that could have used a little work, and a joystick or two that probably could use an overhaul, but I’m sure they’ll check some of that stuff off the list as time goes by. There are custom-built ledges conveniently placed in between each machine to place your drink and cups of tokens, which is super handy, and standing tables in the middle of the back bar for taking a break or waiting your turn on a machine while you drink. TVs throughout the bar showed ’80s and ’90s movies, and pop music from the same eras played loudly. I didn’t check out the jukebox but I’m assuming that’s what it’s full of. I spent a couple hours at Player 2 and didn’t even get through all my tokens. The first thing I did was get the high score on Ms. Pac (which had the speedup mod), and it stayed there for the entire time I was there. I’m sure someone else probably killed it before the night was over. I also took a shot at Donkey Kong — one of my favorites, and nowadays a very popular game on the competitive scene — and actually ended up having one of the best games of my life. There was a gentleman who was on the machine much of the night, putting up scores ranging from 60k-80k+, and had his initials filling the top half of the ranking screen. When I got a shot at the machine, I passed up his top score on my first man, and went on to achieve a score of 120,700 — my personal second-best score (my top is 122,000). It’s not a competition-level score, but it was good for me (I don’t point-farm on the rivet level either), and put me on top of that machine’s leaderboard for the time I was there. I played a little bit of almost everything, doing well at some games and terrible at others. As I mentioned, the place was very busy, but not so busy that I couldn’t move around. The front bar started filling up more as I left around 11pm, so it looked to me like they had a very successful opening night. It was clear that everyone there was having a great time, lots of shouting, laughing, and enthusiasm. Between the energy of everyone there and that little spark of competition for high scores on the classics, it really started to feel like the old days just a little bit. If they had any opening night glitches, like most new establishments do, I certainly didn’t detect them as a customer. My only recommendations for improvement would be the addition of more pinball (I’m sure they will do so eventually) and more shmups (although I don’t quite see this being the type of place that would add Japanese-style cabs loaded with Cave shooters). Of course, you can never have enough of the classics, and I’m sure everyone would love to see games like Star Wars, Asteroids, Dragon’s Lair, and others added to the floor, but in the arcade hobby/business, you get what you can. I can’t wait to see how they grow. 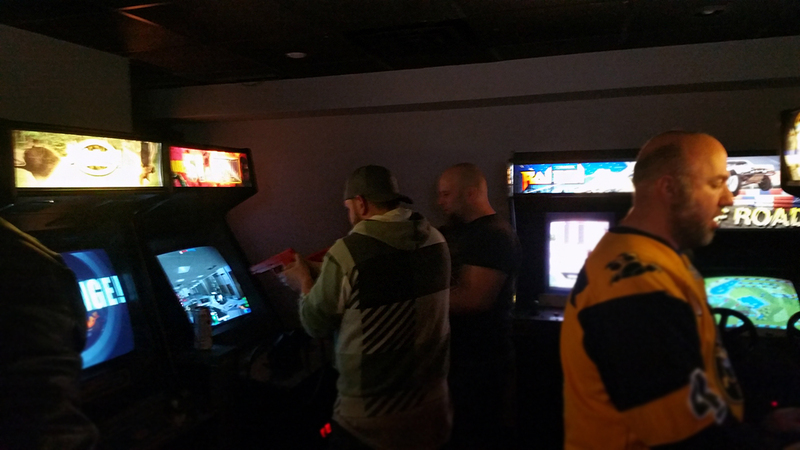 Overall, I’m just super happy to see a new arcade (with beer!) in Appleton. It’s been wayyyy too long. I’ll be back — I have to be, I still have tokens left! 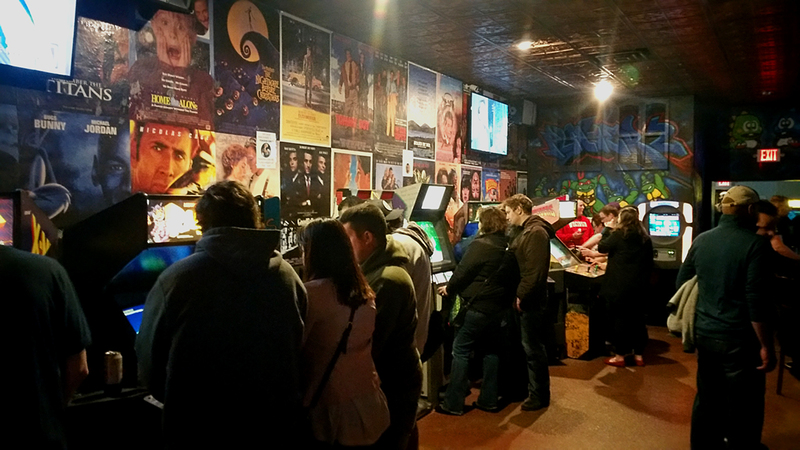 Player 2 Arcade Bar is located at 215 E. College Ave., Appleton, Wisconsin.